Overflow RV sites are utilized at Covered Wagon RV Park during peak periods (cooler months or major events), when our park typically fills up easily and there aren’t many designated RV sites available for our customers. 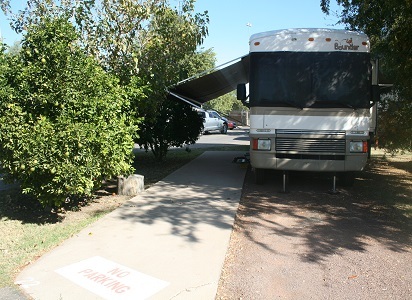 We have created about 8 RV sites around the park utilizing the corners and the extra spaces between RV sites. 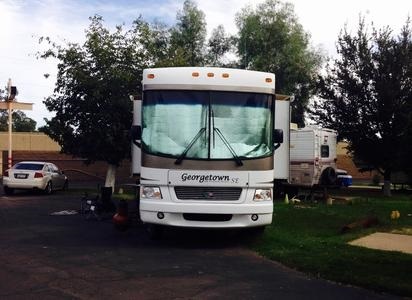 These overflow RV sites have their own hookups for water, sewer and electric but do not have a concrete slab that serves as the patio in the regular RV sites. They might not also have as many shade trees around them as well. To compensate for the inconveniences, we will not charge for electricity for the overflow RV sites. We use the Overflow sites only when the park is full and usually only temporarily. Within a few days, when a customer at a regular RV site leaves, we will move customers from the overflow site to the regular RV site.